In response to God’s love for us, the nonprofit fund-raising entity, Ruth’s Room, Inc. is established for and committed to the purpose of supporting the work of Habitat for Humanity of Denton County in providing simple, decent housing in partnership with God’s people in need. Ruth’s Room was established in November of 2000 to benefit Habitat for Humanity of Denton. It was named for Ruth Hodges, mother of Bunny Hodges, our founding director. Founding members, Bunny Hodges, Nelia Thorp, and Alex Lieban, were joined by James McDade and Diana Dunclau in designing the look of the thrift store and in getting it off the ground. Ruth’s Room opened its doors on December 16, 2000 at 721 N. Locust St. and took in enough on the first day to pay the following month’s rent. An attempt to operate a ReStore in the barn behind the shop, Bart’s Barn ( named for Bunny’s father, Bart Hodges) was abandoned in favor of using the space to store the avalanche of donations pouring in from a generous community. In 2002 Ruth’s Room was outgrowing its space and consideration was given to a search for larger quarters. 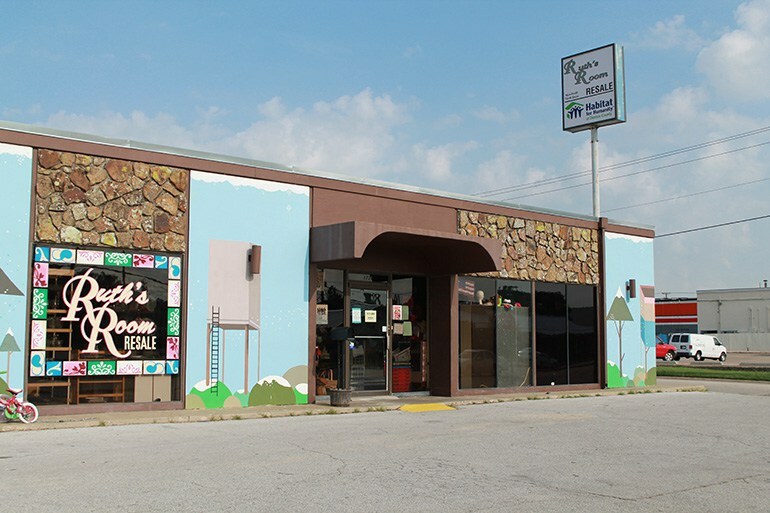 After the merger in 2003 of HFH of Denton and the Lewisville affiliate, resulting in Habitat for Humanity of Denton County, the expanded affiliate purchased the building at 1721 N. Carroll Blvd and Ruth’s Room geared up to relocate. In November, 2003 Ruth’s Room incorporated as a 501(c3) non-profit organization and began planning its move to the new location. On April 7, 2004 Ruth’s Room opened its doors in the remodeled facility along with Bart’s Barn (established by HFH of Denton County). The affiliate moved its office into the building during the summer of 2005. The community continued to bless us with its donations and patronage, and we once again were bursting at the seams. Bart’s Barn moved to a new location in 2006, and Ruth’s Room expanded to fill the vacant space. Bart’s Barn changed its name to the ReStore and moved again in the fall of 2010. It is now located at 1805 Cornell, less than a mile from Ruth’s Room. We continue to work together as a team to provide Denton County with gently used goods. Ruth’s Room Too, a shop selling books, tapes, records, CDs, etc. opened in February of 2012 at 615 Sunset in Sunset Center next to Ruth’s Room. In June of 2011 Ruth’s Room donations to Habitat for Humanity of Denton County surpassed $1,000,000. As of 2013, HFHDC has built three houses in honor of the volunteers at Ruth’s Room. We thank God for the guidance He has given us and we are deeply thankful for our dedicated volunteers, the heart and soul of Ruth’s Room.